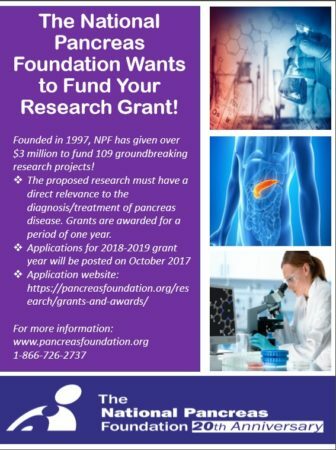 NPF raises and directs funds to support exemplary research projects in the field of pancreas disease. The deadline for the current 2017 research grant cycle is January 31, 2017. Applicants should complete the original 2017 NPF Grant Application (DOC). International applicants at accredited universities are also encouraged to apply. Using a single electronic file (Microsoft Word or Adobe PDF format), the application format should be as follows using the headings listed below. Preliminary Data: If this application represents a resubmission, a description of what new information or data should be clearly outlined as well as any publications citing the NPF. Maximum of two pages. Proposed Studies and Methods: Anticipated results and pitfalls should also be included. Maximum of three pages. Budget Justification: Not more than one page. Justification for salary support and supplies and equipment listed in the budget page should be detailed. Biosketch and Other Support (maximum of 3 pages per investigator) should be submitted in NIH format for the Principal Investigator and other investigators listed in the application. Potential overlap with other funding should be clearly detailed. The Principal Investigator and the Institutional Representative must sign the application before it will be accepted for review. The Abstract portion of the application should contain enough information to adequately explain the project and its relevance to the pancreas. The budget should be inclusive and for direct costs only. Justification is needed for all equipment purchases over $ 500.00. The Attestation Statement must be read and signed by the Principal Investigator. Item number 6 refers to the Investigator’s commitment that the research will be conducted under the supervision of an Institution at which appropriate standards and oversights are working. Please submit the application via electronic file in Microsoft Word or Adobe PDF format as described above to the NPF website here. We will only accept applications electronically please do not mail a paper copy to the NPF office. Notification The notification of the decision of the Board of Directors regarding funding will be mailed to the applicant and the Institutional Representative after the Board meets, usually in late April or early May.